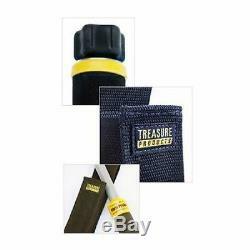 Treasure Products Vibra-Probe 585 PinPointer Underwater Metal Detector. Carry Bags, Pouches & Covers. The only pinpointer with tip only detection, so you know precisely where the target is. The Vibra-Probe uses unique tilt on & off technology, in addition to our traditional one-minute automatic-off battery saver. This translates into faster recovery times and longer battery life. The Vibra-Probe uses our unique tilt on & off technology, in addition to our traditional one-minute automatic-off battery saver. 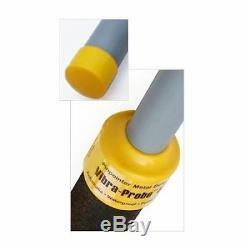 The Vibra-Probe is the original pinpointer that communicates with vibration. It alerts only you that you've found a target. Never worry about dirt, dust, mud or water because our unique sealed design is airtight and waterproof to a depth of 100 feet. The Vibra-Probe 580 is fully automatic. The self-calibrating microprocessor-controlled circuitry requires no adjustments of any kind. The included belt holster makes it easy to carry and always at the ready. Tilt On and Off - No push button switches. The Vibra-Probe 580 turns on and off when pointed upward or will automatically turn itself off one minute after the last detection. Pulse Induction (PI) - This technology allows hunting at the beach in salt water or in any type of soil, including black sand. True target direction - The Vibra-Probe 580 detects at the tip only, not along the shaft, enabling precision target pinpointing. Waterproof - Unique sealed design allows the Vibra-Probe to be used in the rain, mud, or under water to a depth of 100 feet. Automatic tuning - The state of the art microprocessor controlled design requires no adjustments of any kind. Communicates with vibration - The Vibra-Probe 580 signals with pulses of vibration when a target is located. It replaces the need for buzzers that can be difficult to hear, especially when wearing headphones from a primary detector. Detection depth stability - New advanced circuitry maintains the unit's detection distance throughout the life of the battery. Target distancing - The pulses of vibration increase in frequency as the probe tip approaches the target. Low battery indicator - Built in low battery sensor alerts you when the battery is low and needs replacing. Easy battery installation - The standard nine-volt battery is quickly changed without tools. Simply rotate the rear knob and pull out the compression seal to access the battery compartment. Solid construction - The Vibra-Probe's rugged sealed construction and stainless steel hardware are built to last. Holster - Includes belt mountable holster for easy carrying. 1 inch (2.5 cm). Submersible to 100 feet (30 meters). 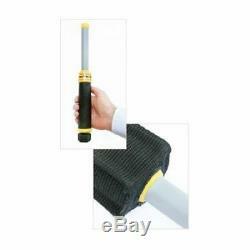 Vibra-Probe 580 Pinpointer Metal Detector. Here is a quick reference side-by-side comparison of each Treasure Products models main features and specifications. More details can be found on each individual product page. Manual tilt on & off. Our reason for being is to help You find the Best Metal Detectors and Accessories that fit Your specific needs. It's simple, we say NO to junk and make your Metal Detecting Experience GREAT. With Serious Detecting you know you will get high quality products and service without compromises. 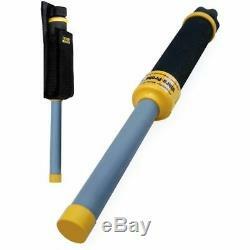 The item "Treasure Products Vibra-Probe 585 PinPointer Underwater Metal Detector" is in sale since Wednesday, January 23, 2013. This item is in the category "Business & Industrial\Test, Measurement & Inspection\Test Meters & Detectors\Metal Detectors". The seller is "serious_detecting" and is located in Ypsilanti, Michigan. This item can be shipped to United States, Canada, United Kingdom, Denmark, Romania, Slovakia, Bulgaria, Czech republic, Finland, Hungary, Latvia, Lithuania, Malta, Estonia, Australia, Greece, Portugal, Cyprus, Slovenia, Japan, China, Sweden, South Korea, Indonesia, Taiwan, South africa, Thailand, Belgium, France, Hong Kong, Ireland, Netherlands, Poland, Spain, Italy, Germany, Austria, Bahamas, Israel, Mexico, New Zealand, Philippines, Singapore, Switzerland, Norway, Saudi arabia, Ukraine, United arab emirates, Qatar, Kuwait, Bahrain, Croatia, Malaysia, Brazil, Chile, Colombia, Costa rica, Dominican republic, Panama, Trinidad and tobago, Guatemala, El salvador, Honduras, Uruguay.